A tulip that will spread to form a clump, Tulipa saxatilis not only has beautiful flowers it also has an interesting growth habit. This is a species that spreads slowly by underground stolons or runners, so over time it forms a nice large clump. The rate of spread is slow and in our garden it is in no way invasive. Originally from Crete and Rhodes, it will survive hot summers and grows well in a little shade as well as full sun. 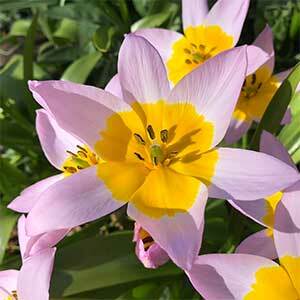 Plant the bulbs at 10 – 15 cm deep in well drained soil. This is tulip that spreads by underground stolons, it can also be propagated from seed. When dormant you can dig and divide the clump, best done after the foliage has died right back near the end of summer. 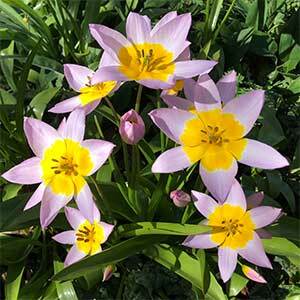 Common Name – Candia Tulip, Lilac Wonder. Height – To around .2 metres (8 inches). Spread – To around 8cm 3 inches. Flowers – Lilac petals with a yellow centre.